There are a range of best practices associated with smart growth, these include: supporting existing communities, redeveloping underutilized sites, enhancing economic competitiveness, providing more transportation choices, developing livability measures and tools, promoting equitable and affordable housing, providing a vision for sustainable growth, enhancing integrated planning and investment, aligning, coordinating, and leveraging government polices, redefining housing affordability and making the development process transparent. 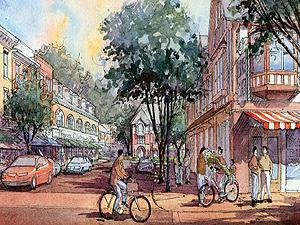 Related, but somewhat different, are the overarching goals of smart growth, and they include: making the community more competitive for new businesses, providing alternative places to shop, work, and play, creating a better “Sense of Place,” providing jobs for residents, increasing property values, improving quality of life, expanding the tax base, preserving open space, controlling growth, and improving safety. Smart Growth America advocates for people who want to live and work in great neighborhoods. We believe smart growth solutions support thriving businesses and jobs, provide more options for how people get around and make it more affordable to live near work and the grocery store. Our coalition works with communities to fight sprawl and save money. We are making America’s neighborhoods great together. At the heart of the American dream is the simple hope that each of us can choose to live in a neighborhood that’s beautiful, affordable, and easy to get around. We want to create healthy communities with strong local businesses, schools and shops nearby, transportation options and jobs that pay well. Americans want to make their neighborhoods great, and smart growth strategies help make that dream a reality. Smart growth is about creating local jobs and protecting the environment. It is about being able to safely walk to a park close by. It is about spending less time in traffic and more time doing what’s important to you. Coalition Building: Governors, business owners, bicycle activists, parents and organizations across the country are all part of growing communities that can be even greater. Smart growth is about making neighborhoods work for everyone, and the more people involved in that process the better. Policy Development: From using federal stimulus dollars to repair roads and create low-cost options for transportation, to adopting local water policies that work for developers and homebuyers alike, we are a policy resource on all things smart growth. We work with leaders at all levels of government to show which policy options are best for different communities and can help communities go from idea to implementation. Research: We make sure the smart growth policies we promote are not just good theory, but proven ideas. Research on topics from urban development to transportation to the cost of vacant properties in your community inform our work and are available online. New research is posted regularly, giving policymakers, businesses, and community groups the tools they need to make sure growth is smartly done. Smart Growth America’s Sustainable Communities Network is an opportunity for state and local government officials, business leaders, nonprofit professionals, and others to ask questions, learn best practices, and share project ideas with people around the country. The network also shares updates about federal initiatives, upcoming events, webinars and conferences to support vibrant, sustainable communities. On June 16, 2009, the Environmental Protection Agency (EPA) together with the U.S. Department of Housing and Urban Development (HUD) and the U. S. Department of Transportation (DOT) formed the Partnership for Sustainable Communities, a collaboration between the three federal agencies to help improve access to affordable housing, create more transportation options and lower Americans’ transportation costs while protecting the environment in communities nationwide. This unprecedented collaboration between federal agencies means all three are better able to solve interrelated challenges. Whether it’s the impact of transportation choices on the environment, or the impact of housing decisions on transportation choices, the Partnership grants HUD, DOT and EPA the ability to coordinate federal policies, programs and resources to achieve multiple goals at the same time. This means a more efficient policy process and a better use of taxpayer dollars. Guiding the Partnership’s work is a set of livability principles and a partnership agreement, both available here. To learn more about what the Partnership is doing now and what resources are available to state and local leaders, visit Smart Growth America’s blog about the Partnership for Sustainable Communities.